The design and construction of St. Petersburg – at the instigation of Peter the Great in the early 17th century - was the central theme of Richard Sills’ talk at the General Meeting of ACU3A in January. At that time, the great cities of Europe (Paris and London) were already well established and it was Peter the Great’s ambition to ‘westernise’ Russia. Earlier, in the 16th century, Russia had expanded its territory to the East but had no access to the Black Sea. Also, its Northern ports were icebound in winter. Therefore, the need to establish a trading port on the Baltic Sea became a further driving force behind the development of this most unsuitable of territories for the location of the city: 19 islands of marshy ground and subject to flooding. In spite of these difficulties, from the 17th century onwards, Peter the Great and his heirs commissioned a succession of European architects to design and oversee the creation of some of the most beautiful buildings in the world on that site. Domenico Trezzini (1670 – 1734), influenced by the Dutch school of architecture, was encouraged by the Russian nobility to move in and build there; he became the principal architect of St. Petersburg in the early days. 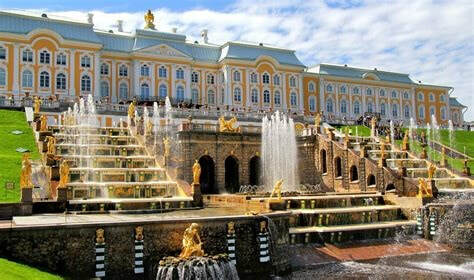 It was during this period that the design for Peterhof Palace and its gardens (“Russian Versailles”) was commissioned. Also, Tsarskoya Selo, one of the most magnificent palaces in Russia located 24 kilometres from St. Petersburg, became the country residence of the imperial family and visiting nobility. Architectural styles changed over subsequent years. For example, German architects designed buildings in the baroque style and, as trade in furs, wood and minerals enriched the city, additional grand buildings were commissioned and built on more stable ground around the Naval Academy. When Catherine the Great became Empress of Russia in 1762, she favoured the classical style of architecture, of which the Hermitage Museum, incorporating the building formerly known as the Winter Palace with its magnificent staircase, is probably the most well-known. But perhaps the greatest anomaly in architectural terms in St. Petersburg is The Church of the Saviour on Spilled Blood, which is reminiscence of the onion domes to be found at St. Basil’s Cathedral in Moscow. 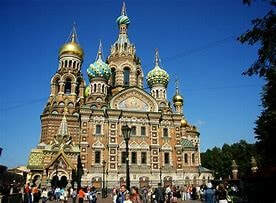 No other building in St. Petersburg matches its elaborate and distinctive design. Richard’s knowledge of the history, politics, architects and buildings of St. Petersburg matched the wonderful selection of slides he presented. Thank you to Colin for organising this most interesting speaker.